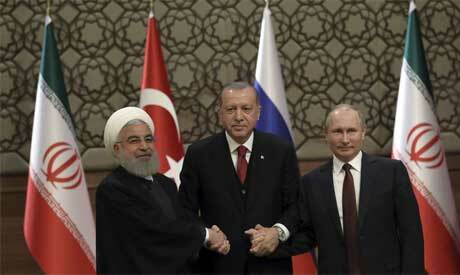 When the presidents of Russia, Turkey and Iran meet Friday in Tehran, all eyes will be on their diplomacy reaching a last-minute deal to avert a bloodbath in Idlib, Syria's crowded northwestern province and last opposition stronghold. The three leaders, whose nations are all under US sanctions, have an interest in working together to contain a potentially catastrophic offensive by President Bashar Assad's forces to recapture the province, but Idlib is complicated and they have little common ground when it comes to Syria. President Recep Tayyip Erdogan of Turkey, which supports Syria's rebels, stands to lose the most from an assault on Idlib. Turkey already hosts 3.5 million Syrian refugees and has sealed its borders to newcomers. It has also created zones of control in northern Syria and has several hundred troops deployed at 12 observation posts in Idlib. A government assault creates a nightmare scenario of potentially hundreds of thousands of people, including militants, fleeing toward its border and destabilizing towns and cities in northern Syria under its control. "I don't think that there is a total solution for Syria on the table, but certainly it is a defining moment," said Sam Heller, a senior analyst at the Brussels-based International Crisis Group. He said if Damascus retook Idlib, it would mark its near-total victory over the opposition, but it will likely also bring humanitarian suffering and carnage on a scale not yet seen in the seven-year war. Staffan de Mistura, the UN's Syria envoy, made a personal appeal to Erdogan and Putin to find a "soft solution to this crisis." "We look to Russia, Turkey, Iran to come with hope to the civilians in Idlib," he said. "There are indeed many more babies than there are terrorists in Idlib. There are a million children." Friday's meeting in Tehran marks the third time the presidents of Turkey, Russia and Iran have met over Syria in less than a year. In the absence of an engaged United States, they have taken it upon themselves to manage Syria's messy civil war, and their previous meetings in Sochi and Ankara established so-called de-escalation zones in several areas, including Idlib, that temporarily reduced violence. All these agreements were later violated as Syrian troops, backed by Russia and Iran, moved to retake those areas after pounding them into submission with airstrikes. Tens of thousands of civilians, along with capitulating rebels and militants from Homs, Aleppo, Ghouta, Daraa and other areas were packed in green buses and taken to Idlib, where the war's last showdown is about to unfold. Only this time, there is nowhere left to go, and remaining fighters are more likely to fight until the end. He added, however, that Russia "is acting cautiously, selectively and is trying to minimize possible risks for civilians." He added that the Russian and US militaries, as well as diplomats, are still in touch on the situation in Idlib. "I think the military situation will become clearer after the leaders of the three countries hold talks on Friday," he said. Assad has built up forces around Idlib, vowing to retake the province. Turkey, which backs the rebels in Idlib, is warning against such a move, saying it will be disastrous. Moscow, meanwhile, has moved 10 warships and two submarines off the coast of Syria in a huge show of force. At the core of Idlib's predicament is the thousands of jihadists entrenched in the province along with the civilians. The al-Qaida-linked Levant Liberation Committee, formerly known as the Nusra Front, remains the dominant force there, and any deal would most likely entail intensified Turkish efforts to oust the militants. Russia is reportedly talking to the group through mediators about dissolving itself. Instead of a full-scale assault, Russia, Turkey and Iran could agree to a piecemeal approach that would see government forces taking off bites of the province, including cities like Jisr al-Shughour, close to Assad's coastal heartland in Latakia province, and Maaret al-Numan and Khan Sheikhoun, which lie on the M5, a key highway that runs through Syria's major cities. According to an analysis by the International Crisis Group, one compromise plan could entail ending recurrent rebel drone attacks on Russia's Hmeimeem air base in Latakia by withdrawing the de-escalation zone's protection from specific problem areas, and reopening key highways in return for suspending a government offensive in Idlib to enable Turkey to find a solution to the province's jihadist challenge. For Turkey, however, the loss of Idlib would represent a humiliating failure that threatens to completely defeat Ankara's interests in Syria. Can Acun, foreign policy researcher at the Ankara-based Foundation for Political, Economic and Social Research, or SETA, said Turkey will try to push at the summit for any operation in Idlib to be limited, "one that targets only terror and radical groups." He said Turkey could propose that the Turkish-backed Syrian opposition forces and other moderate groups in Syria be used "to weaken" the radical groups in Idlib. Russia, which has seen its ties with Turkey grow amid Ankara's ongoing row with Washington, may be willing to compromise to protect the budding relationship. Volkan Bozkir, head of the Turkish parliament's foreign affairs committee and a senior official of Turkey's ruling party, said he was hopeful a political solution would emerge at the meeting. "They (Turkey, Russia and Iran) are all smart nations," Bozkir said. "I am hopeful that a formula can be reached with diplomatic ways, with smart policies and not through the use of guns."